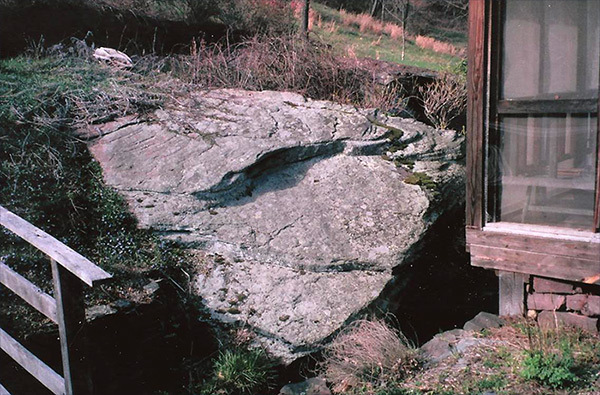 Today, I admit to having rocks in my head, specifically, two truck-size boulders behind our log cabin in the mountains. They sit within arms length across the stream that flows by the footers of our screened-in porch and they’re one of the joys of cabin life. Though they are the red shale that colors all the dirt in the area called red dog, their surfaces are sun bleached or tinged slightly green by lichen, except for the dark moss that grows where sheltered pockets of dirt accumulate. A good portion of that dirt comes not from decayed plant life but from various animals–generally groundhogs and sometimes bears–who sun themselves and leave behind defecation decoration. As the cold weather comes, the moss turns a rust shade that quietly joins the red berries on euonymous sprigs that stretch across the silver stones. The accompanying sound track features chirping birds, the gurgling creek, and kerchunking frogs. We watch and listen, eating as many meals on that porch as the weather allows. When we pay attention, it’s a meditation but we’re often interrupted by deer, groundhogs, and “grinnies.” I had never heard that name for chipmunks and have no idea how it came about, but that’s what all our neighbors call them. Recently, we’ve noticed that their busy-busy darting movements don’t distract the way the used to; their population has sharply dropped. The locals speculate that a reintroduction of coyotes into the area is to blame. Grinnies would surely be bite size for them. The groundhogs usually burrow under one of the two boulders to birth a litter each year. The little ones are about as cute as any varmint could be . . . until we think ahead to the mess they’ll eventually make of Ada’s flower garden. The deer can be pretty destructive too. We delight in watching them, ears cocked, stepping with infinite delicacy, then abruptly leaping away, white tails winking as they disappear into the trees. The rarest of our animal sightings (aside from some of the humans who heave into view) have been one red fox and a pair of bobcats that sauntered up our drive and past the cabin. Those people shy felines really do have tails that look as if they had had the poodle treatment; but no vet can claim credit. There are two boulders now about 10' apart, each with facing sides matching up with the other, showing that they were once a single boulder before a prehistoric glacier split them apart.